Most modern color sensor are using a Bayer sensor. Bayer sensor delivers raw image that needs to be color interpolated to generate the real color. TroublePix can perform accurate real time Bayer renderring to allow live color image display while still streaming the raw image to disk. A raw image is 1/3 the size of a color image but contains all the color information uninterpolated. In addition to real time color renderring, raw sequences can also be exported to true RGB 24 or 48 bit color image. Various interpolation algorithm can be choose to assure the best posible color renderred image. Remapping specific pixel values to some other values. 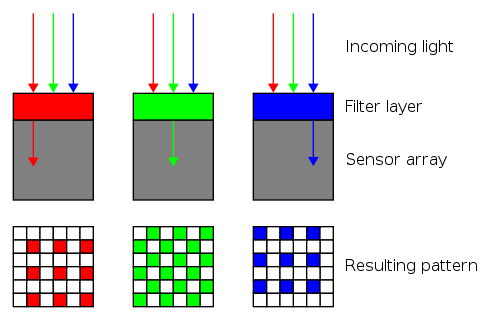 This can be applied, for instance, as a rescaling tool for all captured pixel intensities. It can also be used to remap 10, 12, 14 or 16 bit pixels to a more comprehensive set of intensities. It can be used to generate pseudo color for monochromatic images, where specific intensity can be highlighted with separate false color. The colors remapping is performed real time, via anamorphosis. Look up tables are used to define the remapping level. Independent RED, GREEN, and BLUE levels can be specified, via predefined tables, files, or predefined formulas. The module can be applied with almost all TroublePix supported image formats: 8, 10, 12, 14 and 16 bit pixels, color or monochrome.